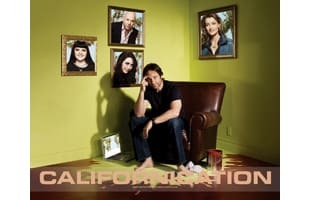 Californication stars David Duchovny as a troubled novelist who moves to Cali and suffers writers block which complicates the relationship with his girl friend and daughter. Californication airs on Showtime. Bidding Farewell to Hank Moody and "Californication"
Showtime Sets Premiere Dates For "Shameless," "House of Lies," and "Californication"